The Ameriplan® Dental Plus Package includes Dental, Vision, Prescription and Chiropractic discounts. Dental Plus also includes discounts. The family plan is just $25.00 a month. The Ameriplan® Med Plus Package includes the Telemedicine program, Hospital Advocacy, Ancillary Services, and Prescription Discounts.. The family plan is just $25.00 a month. This plan applies to anyone living in the same household. Our Ameriplan® Combo Package includes all programs from Dental Plus and Med Plus combined! This program would provide you Medical (physician care, Ancillary Services, Hospital Advocacy, Nurseline), Dental, Vision, Prescription and Chiropractic Discounts! It also includes Telemedicine. Telemedicine gives you 24/7 access to doctors by email or phone call. This plan is $40.00 a month and covers your entire household. All ongoing dental problems are accepted, except orthodontic treatment already in progress! Know that you need a treatment? Sign up and start saving instantly! More than 50,000 pharmacies nationwide including most national chain pharmacies, such as Eckerd, Walgreen’s and K-Mart. Save up to 25% on most brand-name prescription drugs. Save from up to 50% on most generic prescription drugs. Special savings on most high volume and maintenance type drugs. Most prescription drugs are included, both at the retail pharmacy and by mail order. Includes special prescription monitoring service for individual drug history. You may not receive a savings on some high volume or maintenance drugs since these medications may have already been reduced at the pharmacy level. You will recieve a TOLL-FREE NUMBER to locate independent and chain-participating network pharmacies. Our Vision Plan has more than 12,000 Providers in the United States including most national chains such as LensCrafters, Pearle Vision, JC Penny, and Sears. Unlike AmeriPlan’s® proprietary dental and chiropractic plans, the vision plan is administered by Coast to Coast Vision. Save from 20%-60% on all frames, lenses, tints, scratch resistant coatings, & UV protection. Save from 5%-30% on ophthalmology exams and surgery (including RK & ALK) with certain providers in selected markets. Save up to 60% on contact lenses including daily wear, extended wear, disposable, tinted, bifocals, and gas permeable. Contacts are available through mail order only. When requesting service, member must identify themselves as a member of Coast to Coast Vision Plan. Refer to the logo on your membership ID card. 30% SAVINGS on all treatment and other services, including massage therapy. A toll-free number to locate independent and chain-participating network chiropractors. Ameriplan’s Med Plus® PROGRAM that includes Telemedicine, Hospital Advocacy, Ancillary Services and Prescription Discounts! Over 400,000 Primary Care Physicians in our Network! 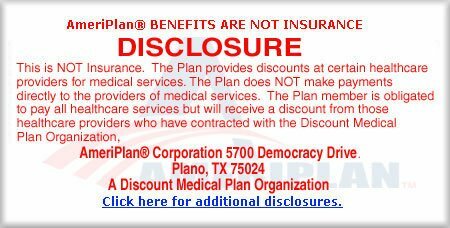 Savings will be up to 50% and a full array of medical services as well as the Benefit & Savings of utilizing an Ameriplan Health® Patient Advocate to represent you! You have the DECISION MAKING Power! Take advantage of Ameriplan’s® large customer base! What makes AmeriPlan Health® Different and Better? Because It is Consumer Driven Health Care, not Insurance. No pre-authorization for treatment. You and your health care provider make all medical treatment decisions. No Paperwork and no insurance companies to deal with. All specialists included, where available. No age limit on treatment or services. Includes newborn to geriatric care. You can change physicians whenever you want. Membership fee guaranteed for two years. office for routine and common conditions. Ameriplan® IBO Plus Business Opportunity Ready to join our team? Become an Ameriplan® independent business owner now! According to US Government statistics* over 15% of Americans were without insurance in 2003, including over 8 million children; in addition, 43.6 million** Americans were underinsured the same year. As the nation’s premier Provider Access Organization, AmeriPlan® is positioning itself to provide Americans with much-needed affordable supplemental healthcare. For AmeriPlan® members and providers, this presents the career opportunity of a lifetime! Become an Ameriplan® independent business owner. Ameriplan® offers a great home based business opportunity. You can become an Ameriplan® independent business owner and enjoy working at home without having to commute or pay a babysitter. This is great for moms who want to work at home. You are a independent business owner for Ameriplan® which means you are a home business owner. It is not a difficult business as you will be offering people something they need at an affordable price. Ameriplan® is not a get rich quick scam. You have to be willing to put in the time and work hard, however, Ameriplan® has to a lot of training and resources to offer to get you started and help you establish your business for the long run. Ready to join the team? Become an Ameriplan® independent business owner Now!